Black Boobie Fly UV Straggle String with white foam Para Post eyes. Tighter wraps of Straggle String give a bushier body. Brown trout weighing 5lbs taken fishing from the Ohau A intake wall, Twizel Canals, on a Boobie Fly UV Straggle Chenille lure size 4 hook September 2016. The eyes were cut from a jandal. The boobie fly is a good imitation of the common bully – Gobiomorphus cotitianus, in profile if not in colour. The common bully is more of a mottled brown colour. There is no reason you couldn’t tie up some of these in a dark brown to make a more accurate representation. 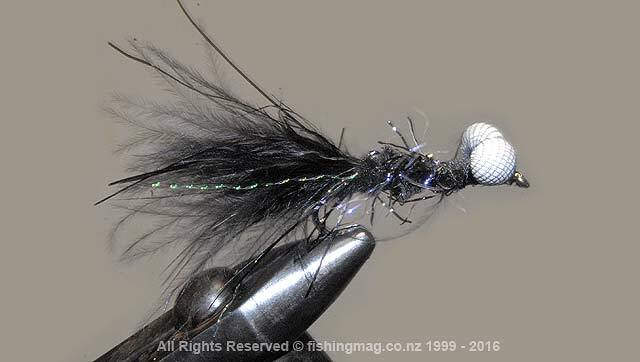 The black version works very well indeed, particularly for targeting the large browns and rainbows found in the Twizel Canals of the Mackenzie Country. Bullies are an abundant food source for these big canal trout and they make up a substantial part of their diet, so it makes sense that any sort of bully imitation will be a winner. Begin by under binding where the foam eyes will go before binding on the Para Post foam with figure 8 loops. The stand out feature of this fly is its buoyant foam eyes. When the line is retrieved the boobie fly dives deeper. When the line becomes slack the fly floats upwards imparting a swimming fish-like action. There are several ways of making floating eyes for boobie flies. The old way of doing it was to take a small polystyrene ball of the sort found in bean bag chairs. This is then held in place by first wrapping it in a 25mm x 25mm square of nylon pantyhose or stocking, and tying to the hook in pairs. Then trimming off the excess stocking material. This works fine and it quite inexpensive though perhaps a little fiddly to tie. You can coat the eyes made using this method with head cement for added strength, but nonetheless, you will typically lose one or both eyes with most fish landed. The modern method is to fashion the eyes from closed cell foam. Rods of this material are sold in tackle stores as Foam Para Posts. These are available in a variety of colours and diameters. For the boobies I have tied here, I’ve used 5mm white Foam Para Posts. The 5mm size looks about right for size 4 lures hooks. The downside of using this material is that it is very expensive for a tiny bit of foam. The packet I have contained nine lengths each 30mm long. Allowing 10mm for each fly means you’ll get 27 flies from a packet. By my calculations, that works out to 36 cents each. Under bind to the rear of the hook. 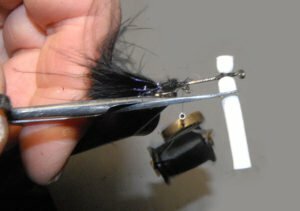 Tie in the black marabou, then the end of the UV Straggle String. I cut the foam to match the opposite side. It is much easier than trying to hold and tie in tiny lengths of foam. For the frugal minded a much cheaper alternative is to buy, or make, a hollow punch and stamp them out of something like a cheap pair of white rubber thongs. Alternatively, you may be able to purchase a sheet of foam from Para Rubber in New Zealand and, using a hollow punch, and go into full-scale production! Punch for cutting boobie eyes from an old car aerial. Straggle Chenille or Straggle String is a modern fly tying body material. It comes on spools in both fine diameter 4-metre lengths, and standard, which is 3 metres long. I’ve used the standard size which has longer fibres. Straggle String has a finer core than regular Fritz materials so doesn’t bulk up as much as your typical Krystal Chenille or Estaz. 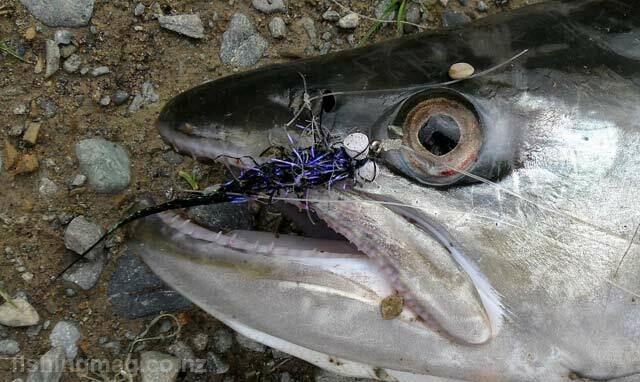 The fibres are reflective and refractive which provides a great baitfish or insect-like iridescence. Slight UV properties make the fly appear very life-like. This fly will really stand out without appearing gaudy or over-the-top. Rainbows in particular really go for this material. 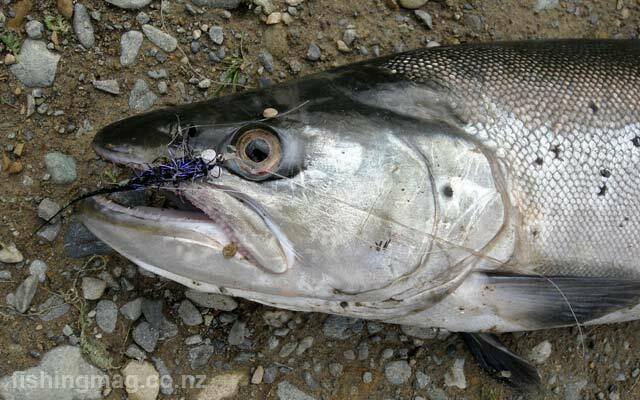 Very large trout taken in the Twizel Canals on a black boobie fly. Note the large white foam eyes. Begin by laying down an under-binding of tying thread where you will tie on the eyes. I like to coat this thread with head cement to lock it to the hook. Next, tie the Para Post in place on top of the hook where you want the eyes. Don’t cut the foam to length yet. Position the foam post about 3mm back from the hook eye, and hanging out the side by 4 or 5 mm. Allow about 3mm or so to tie-off the head. Loop the foam post in place with successive figure 8 knots, making each loop a little tighter than the previous one. Don’t overtighten or you’ll cut into the foam. Make about 10 loops altogether before winding down the hook towards the tail under-binding as you go. Now with the foam post tightly held in place, snip the long side off 4 or 5 mm from the hook to match the other side with a pair of scissors. This method is much less fiddly than pre-cutting the foam eyes to length and then trying to tie them in place. Coat the thread with head cement being sure to place plenty of cement around and between the foam eyes to lock them in place. 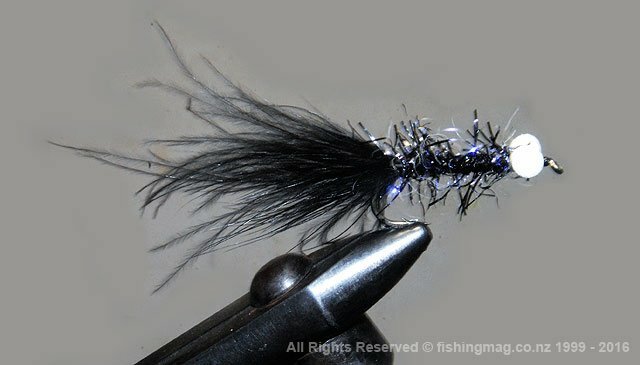 Tie on a good clump of black marabou feathers to for the tail. If you wish you can add a few strands of pearl Mylar over the marabou for even more fish appeal. Tie the end of the UV Straggle Chenille in place over the thread where you have tied in the marabou, then wrap the Straggle Chenille along the body down to the head, tie off and snip. Finally, apply still more head cement over the head binding. There you have it, the finished fly ready to catch a few seriously big trout in the canals or elsewhere. The Foam Para Posts are more durable than the old polystyrene ball eyes and will probably survive until you eventually lose or retire the fly. Black boobie fly using the same materials but with the old style polystyrene foam and stocking eyes which are less durable. You can fish the boobie in the canals on a medium to a fast-sinking fly line. If using spinning gear try a 7 gramme (quarter ounce) sinker and a couple of boobies on short droppers. 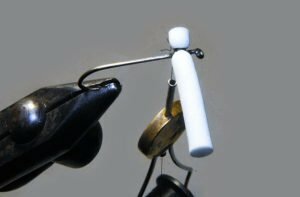 A more typical rig would be something like a black boobie fly on the bottom dropper and nymph on the other. 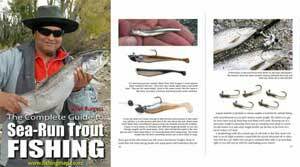 Employ just enough weight for casting and let the rig sink well down before beginning a slow retrieve. Hooks: Black Magic B4 2x Long Shank (or similar). Body: UV Straggle Chenille black – purplish. Here is a link to an older article on the boobie fly. You can also use Estaz for the body material. Close-up of brown trout weighing 5lbs taken fishing from the Ohau A intake wall, Twizel Canals, on a Boobie Fly UV Straggle Chenille lure size 4 hook September 2016. The eyes were cut from a jandal. 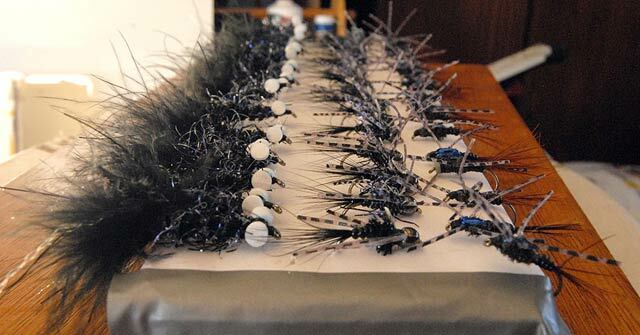 Black bookies, tungsten nymphs, and blue bottle wiggle legs nymphs have all proven to be top fish takers in the Twizel Canals of the Mackenzie Country.